What we call pea soup is invariably split pea soup, made with dried, peeled peas split along the natural division in the seed’s cotyledon. This dish has been around for a long, long time and recipes for pea soup are found around the globe. Peas (Pisum sativum) are typically yellow or green and played a pivotal role in the science of genetics in the research of Gregor Mendel. Yellow peas were unknown to me as a child, so it came as something of a surprise to me to discover that yellow is the genetically dominant color. Yellow split peas are used in Caribbean cuisines to prepare what is called dhal, which is virtually similar to the dhal or daal of the Indian subcontinent, but the vegetable used there is more often the pigeon pea (Cajanus cajan). Yellow pea soup is also a traditional Canadian dish, predictably prepared as in Europe with salt pork. 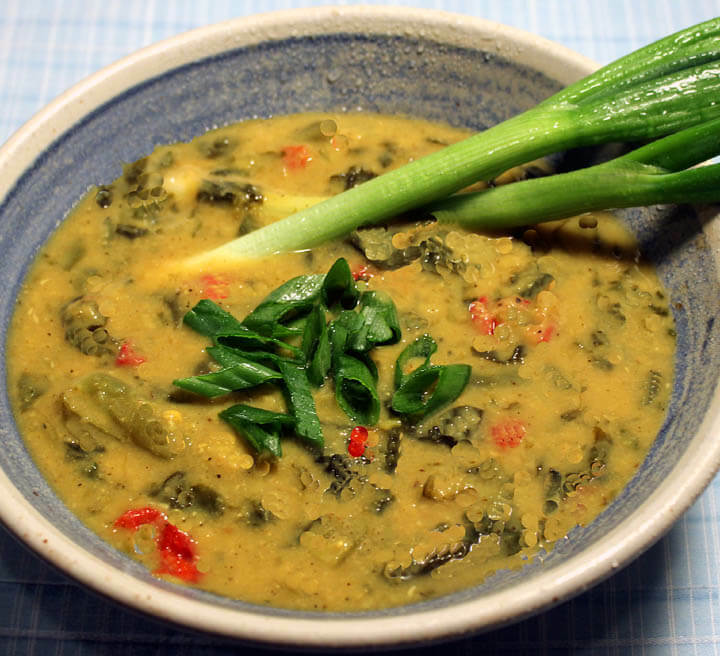 This soup is along the lines of dhal, though not vegetarian since chicken stock is used. The split peas were cooked into a mush in a slow cooker—two cups dried split peas will give you a little over a quart cooked—combined with the other ingredients then placed on a low heat on a back eye to meld. As to the curry, as I’ve said earlier, I am not a curry sophisticate and used the McCormick’s blend from the supermarket along with salt and a little cayenne for kick. Combine 1 quart cooked peas with 3 cups strong chicken stock—I use the bone broth—2 cups chopped blanched spinach and 1 12-oz. container smoked peppers, chopped with a little bit of the juice. Season with salt, curry and cayenne. Serve with toasted flatbread.